and the frailty of the human mind. Served on a cold plate of the surreal and macabre, it is a must read…Especially in the middle of the night. FJ: What motivated you to write a horrific/paranormal book? EN: As a young boy I was enamored with books such as Tom Corbett Space Cadet and his intergalactic exploits, and the Hardy Boys with their adventures into local mysterious happenings. My Mom took me to the movies to see Conquest in Outer Space, The Angry Red Planet and the original Blob, which scared the daylights out of me. So as a youngster I developed a penchant for the mysterious, the surreal, and the macabre. As a young adult I savoured Rod Serling’s Twilight Zone, and Hitchcock’s movies such as The Birds and who can forget Psycho? I moved on to Stephen King and studied the film adaptations of his stories. I was hooked. I knew I wanted to write something, probably not a novel initially so I just started writing short stories about my own experiences, or offbeat and unusual items I had seen in the news. Working in the film and television industry in special make-up effects on shows such as Supernatural, The Dead Zone, and Final Destination further stoked my interest in the surreal and netherworld. I showed a few friends some early stories and received a very positive response. I accumulated eleven stories and with the expertise and help of Tellwell Publishing created an anthology which became Nightmare Pie. I think there is a market for this kind of book, a collection of short stories all different, to be enjoyed when one has fifteen or thirty minutes freedom to read from start to finish during a commute, or in bed before falling asleep. Not everyone wants to take on an 800-page novel, either in reading or writing. FJ: When and where did you come up for the ideas for this book? EN: The common thread in Nightmare Pie is that something weird, bad, unexplainable, surreal, and yes in some cases, horrific is going to happen to somebody in each story. Much like life itself. When and where I came up with the ideas for the stories I sometimes wonder and I think the only answer I can give is based upon my own personal experiences. 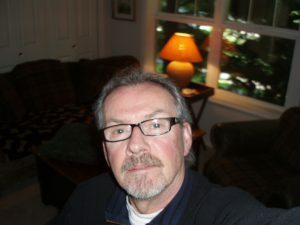 For example, two stories, ‘The Man with the Green Nose’ and ‘Red Roadster Revelation’ are based on my experiences in working at a funeral home part time while I attended chiropractic college. ‘Animal Avengers’ is a reflection of my love for animals and a fitting end for those who abuse them. ‘Garcia’s Revenge’ reports on the plight of Mexicans working in the fields of American farms and a case of severe injustice and retribution. ‘Death in the Forest’ is a new take on the Bigfoot phenomenon and ‘Lowes Descent’ is a story of one man’s paranoid downward spiral caused by the in your face incessant news cycle. The stories focus on the seemingly endless human foible of making assumptions, not recognizing the law of unintended consequences, or finally simply encountering evil head on in one form or another. ‘Teratoid’ was written in response to the terrible Japanese earthquake, tsunami and ultimate nuclear plant meltdown and its effects on the Pacific Ocean and one unfortunate young couple travelling in Japan two years later. ‘Mr. Nocebo Points the Bone’ is a disturbing look at what happens when those in need place their faith in wrong people with ulterior motives. FJ: What is the most spine-chilling part of the book? EN: Each story starts off innocently enough. People going about their business. There is an incident or happening which initiates the thread of the story and plots move forward. Characters must face obstacles which may be persons or incomprehensible situations. How they manage will vary from story to story but in each there is a rising crescendo of events and a climax where either all is lost, or the character survives and moves on but is changed forever. I try to describe characters as people we have all met, going through their lives until something untoward affects them. How are they going to deal with an unimaginable challenge? How would each one of us deal with it? Could we do what must be done in the face of unspeakable danger? Or would we collapse and surrender to the enemy or evil? Each story will culminate in a ‘spine-chilling’ event which may be gruesome, sad, worthy, maddening, or frightful depending on your own take of the characters and situation. FJ: What is the scariest part of writing captivating horror/paranormal stories? EN: I think the scariest part of writing these stories is not the content per se, but having to create characters the reader can relate to, surreal events the reader can possibly comprehend, taking this all through the plot arc, creating interesting and compelling dialogue, and finally bringing it all together in a satisfying ending. Short stories are challenging in this regard as the author does not have hundreds of pages to expand on character personalities and traits, demeanors or faults. This must be done precisely and concisely in few pages at the beginning so we can dive into the plot and move the story along. The reader will imagine the characters in their own mind, following them through the plot arc, the struggle to overcome and/or survive, and ultimately experiencing the fate of the characters in the end. FJ: What gives you Nightmares? EN: I do have recurring nightmares. They seem to have a common trait where I find myself in a struggle to survive either in the midst of a horrific disaster such as a tornado, or driving off a cliff into the abyss. I have a natural fear of heights and in many of my nightmares I find myself trapped on a stairway without rails on the top of a high rise building 100 stories above ground. I am frozen with fear, the stairwell is collapsing and I am about to fall at which time I usually wake up, roll over and try to get back to sleep. I never dream about monsters or aliens, or ghosts, it’s always about being caught up in a life-threatening event, the eternal struggle to survive. Luckily, I seem to escape to live another day and that is good because I must write more stories for my next anthology, Nightmare Soup! Edgerton R. Nicholson wears coats of many colours. When not writing short fiction, amongst other things he is an inventor, a special make-up FX coordinator, a film producer, and a former human chiropractor now working on animals. He lives in the Pacific Northwest with his lovely wife Carole and three dogs and a big fat black cat. Oh yes, he has worn a creature suite in Capetown, South Africa and has owned a beautiful yellow Jaguar E-Type convertible. 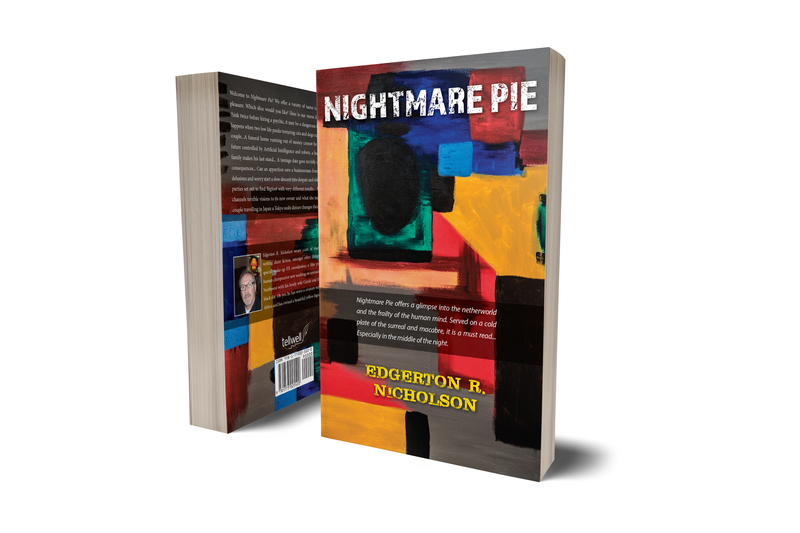 His collection of short stories – Nightmare Pie is available on Amazon, Chapters and Barnes and Noble.